Pro Se Productions, a cutting edge Publisher of Genre Fiction, welcomes Author Aaron Smith to its Pro Se Single Shots Signature imprint. Smith’s Shadows Over America- a series of regularly released digital single short stories- is the exploration of one of fiction’s most mysterious and popular worlds. Dagon ... R’lyeh ... Cthulhu ... the Necronomicon! These are names known only by the most eccentric of scholars, the most daring of occultists, and the most broken-minded of madmen. Forces that dwell in the spaces between spaces, powerful entities that represent the true nature of the universe, things that exist beyond the realm of humanity’s mundane perceptions, to be glimpsed only rarely by physical eyes at a cost that is almost always insanity or death. But there are times when we do come into contact with these unspeakable forces, either by accident or intent, and long, dark shadows are cast over the minds and lives of those who tread the forbidden paths to true knowledge of the vast, harsh universe! Author Aaron Smith explores the mythos created by H.P. Lovecraft and dares readers to come along on this strange exploration of the Shadows Over America. In the debut story in the series, An Exodus of Worms, Garo, a young boy from a primitive tribe in a time before recorded history, is caught up in a series of events brought on by powerful sorcery and resulting in sudden unforgettable horror. If Garo can survive, the course of his life will be changed forever. 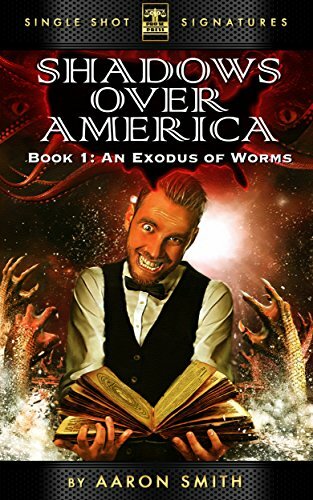 Aaron Smith’s Shadows Over America-An Exodus of Worms features chilling cover art and logo design by Jeff Hayes and digital formatting by Russ Anderson. The first short story in this Lovecraftian series is now available for Kindle at http://tinyurl.com/ozu9qpz and for most other digital formats at http://tinyurl.com/meubrht for only 99 cents. GENRE FICTION PUBLISHER DEBUTS GENRE FICTION COLLECTION BY YOUNG AUTHORS-DESTINIES DARKLY DREAMED NOW AVAILABLE!